For those that have read the book or seen the play. Thoughts? Problems? Points of interest? Reviews? I realise most people wouldn't have finished the book yet, as it came out yesterday. There's a shed-load to discuss though, would be nice to get this going when people do finish! I am only on page 47 but I peeked ahead as I did with HBP, cause I had a hunch that Snape was the Half-blood Prince, and again this time I was right..the cursed child is what alot of us have been waiting for and thought was missing from the epilogue- Delphini Lestrange-Riddle, the Daughter of Bellatrix and Voldemort. So many other things I like, but I am eager to see how she is revealed. But once again I knew it. Haha it was a good reveal. Didn't see it coming at all tbh. Thought she was just a bit of a Tonks-like side character. A lot of people on the internet have questioned with disbelief why Voldemort would ever want a child, however, I think there's a few possible reasons. In that crazy fascistic parrallel-universe we saw where Voldemort wins... it makes sense that "the Augurey" should be in a position of authority (from what I gleaned, she was sort of like the Minister for Magic or other political leader). Voldemort doesn't like to share power. It wouldn't be just anyone that he puts in such a high position. But because he must do so to keep the regime running, who better than his progeny, who is basically half him? It might also be a back-up plan as well as Horcruxes. As we saw, she did everything in her power to bring him back. Just another thing to ensure his immortality and victory. Just gonna drop my Dolphin statement again; I just have two questions; who looks at their kid and says 'yup that's dolphin I'm naming her dolphin *makes dolphin noises*' ?Apparently Bellatrix. Also gonna add that after Delphi's first scene I just started reading her name as dolphin and it made the entire story much funnier. Dolphin is my favorite character in Cursed Child. And how the hell did no one realize Bella was pregnant!? Like my friend so kindly pointed out; Bella was literally on top of Hermione for the torture and Hermione didn't notice a baby bump? How did Cissy not notice, I mean Bella gave birth on her house??? Draco??? Lucius??? You guys are about as observant as my left sock! I mean I can't imagine Bella was quiet giving birth. And what about the mood changes? Like even if she hid the bump there are the mood changes! Idk you do you Bella. Y'all ignore what you ignore Malfoys. - The Oracle of Delphi was called Pythia, the name of a Greek snake goddess. - Sacred serpents played an important role in the "cult of Apollo" at Delphi, with the Oracle apparently receiving prophetic insights by allowing herself to be bitten by poisonous snakes. The venom created a heightened psychological state from which she gave her prophecies. More on this link if anyone's interested. Yeah can't imagine someone already as unhinged as Bellatrix would deal well with pregnancy hormones loool. Although as for actual physical evidence of the baby bump, there's probably magical methods of concealment. Also, theories postulate that the birth occurred before Malfoy Manor. Bellatrix was suspiciously "out-of-action" between the Dark Lord Ascending scene and the Malfoy Manor debacle... link is useful. 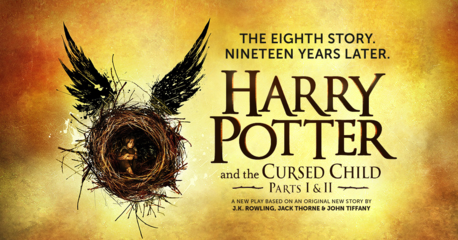 I read cursed child and I have mixed feelings about it, I expected some things better but never mind. My favorite character was Scorpius, he is really amazing. It was entertaining, I guess. The only thing I dislike is that they made Ron out to be some idiot who tells stupid jokes. He seemed to be a lot like Fred and George, except for the fact that Fred and George's jokes were actually funny. Ron's got a soft heart....just what Hermione needs to balance her personality. I really love that we got to see the crazy fascistic parallel-universe of Voldemort winning. It was just a glimpse but a very informative one. The Battle of Hogwarts is derided as a "coup", the good side are "those Dumbledore terrorists". Fascistic-style flags hang in the Ministry, people end their conversations with a creepy "For Voldemort and Valour" flourish. 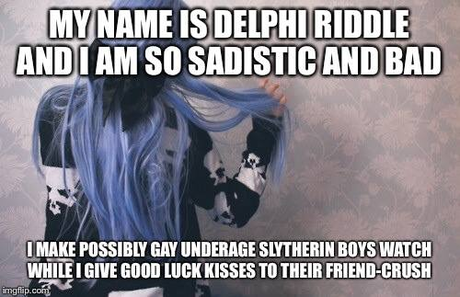 Muggleborns are in death camps. On the whole, they illustrate the full horror of it quite neatly in the short amount of time they have. I also think that AU is one of the reasons Voldemort may have wanted a child. It was interesting to see Delphi's, or "the Augurey's" (lol overt fascism is overt) role in that world. From what I gleaned, she was basically the Minister for Magic/high-level political authority while Voldemort was the "spiritual leader" or Head of State. Umbridge as Headmaster sends her "dispatches", as she did with Fudge. Probably because the regime controls Hogwarts tightly, like the 5th and 7th books but worse- no dissent allowed, just indoctrination into the new prevailing ideology. Polly Chapman quotes what sounds like a political speech from her ("Like the Augurey says, the future is ours to make"). Sounds like a political leader to me. Undoubtedly just a proxy for Voldemort's rule... he doesn't want day-to-day political power that being Minister would give him, and the burden of accompanying boring stuff like financial decisions and regulation-making. Nope, he wants power in the sense that he wants the world done "his way" (which he's certainly achieving) and to be revered (because he's a total narcissist). He's also working on subjugating the rest of the world. Having Delphi as Minister for Magic would seem like a very good option for him.